Forgive the mix up on the days in yesterday’s post. Thought it was Wednesday when it was Thursday, today feels like Monday when itâs actually Friday don’t know where I am. Barely slept Mungy’s and Maud decided to horizontally sleep across the bed on their backs with legs in the air and every time I moved an inch, Maud growled, extremely loudly! So sweet they looked I didn’t have the heart to move them so I am suffering today with lack of sleep. One thousand coffeesâ are in order as itâs a long one. Enough about my domestic problems lets talk wallpaper. Wallpaper I find is one of the hardest things to get right, there are thousands of papers out there on the market and yet I love less than a handful. AND yet they transform a space way more than paint ever can as they bring a totally new dimension to the table. As you all probably know my all time favourite wallpaper is by Deborah Bowness, and we are incredibly privileged to sell it and stock it in our store. 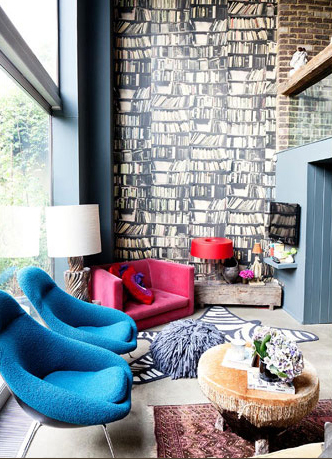 Her Genuine Fake books totally and utterly have transformed every space I have worked on from mine below to one of theÂ Â re-designs I did for Get Your House in Order, Channel 4 toÂ Heston Blumenthal’s kitchen in How To Cook Like Heston, also Channel 4. Told you I wasÂ a fan! So imagine how excited I amÂ to tell you about a new paper Deb has created very much along the same lines which I am papering our new Design School in. Its perfect for the schoolroom as it will cosy it up big time and work beautifully with a very large vintage Moroccan rug I have just acquired. Not only do these papers pack a great visual punch they add instant personality. If you’re struggling with art walls, or if you fancy an instant whimsical vibe, then wallpaper away. All those fears about how scary it is to hang are mumbo jumbo seriously. Pasting table, paste, big brush and a cloth to whizz over once up and wham bam you’ve changed in a wall in little more than an hour or two. Have a lovely weekend, for us its decorating, decorating, decorating. 2 weeks today until the first classes start and there is alot to do!